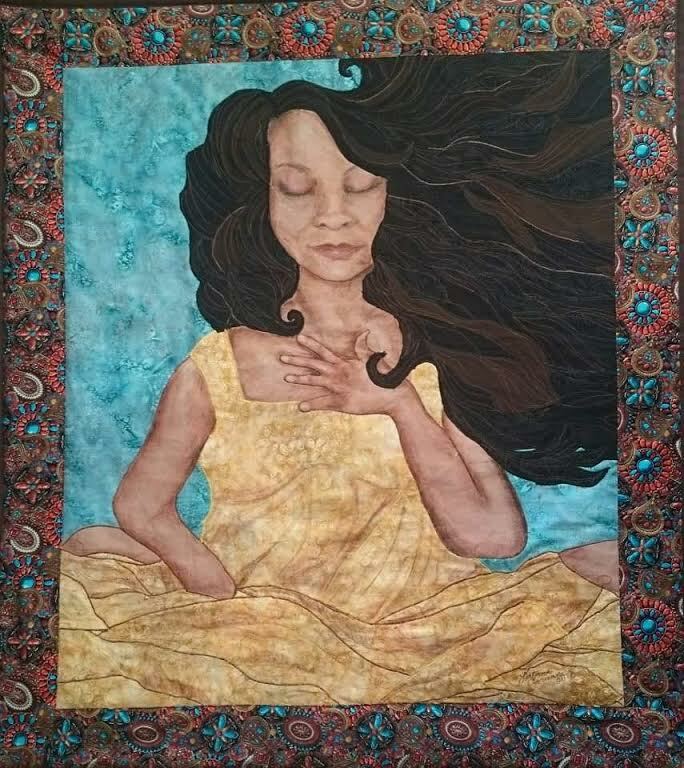 Be Still is my first fabric wall hanging that I explored using pastels with fabric. The soft image and spiritual theme makes me feel so much peace everytime I see her. At the time of creation, it felt like everything that could go wrong did. It was a time when no matter how much I tried, it still wasn't getting me the results I wanted. So, it's time to Be Still. Just wait until your mind can be still and you hear what to do next is such a valuable way to go and this piece poured out of me in love. 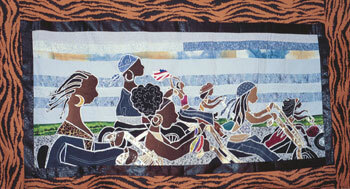 This quilt displays women in African dress playing their flutes in unison. In my imagination I wanted to convey a feeling of unity and oneness at the same time. Each distinct woman can play the flute, but as a collective their harmony can be amazing. When I began this piece I had in mind greens and blues that would remind me of nature and the circle of life. Each season like a dream of being in place in time when you find solitude and happiness. The dramatic changes in color last only a short time. Each frame has a wonderful story to tell and will possibly remind you of a time when the seasons gave you wonder and enjoyment. This piece was inspired by those ladies I listen to on the radio when I was young, and would stand in front of my mirror with the brush as a microphone. On stage they have the audience in the palm of their hands wiht their spirit shining through as they sing. "Divas"has this magical appeal about the whole composition. It is very classy and stylish but also with the gold and subtle red in the border makes this piece really stand out! In understanding God for myself, I never really thought God was some big gray haired white guy with lightening coming from his hands. God has always been loving like my mom and caring like my aunts. So when I talk to God, I imagine God being everything I see in people. All different shades of hair and all different shades of brown, and skin like mine. In my journey, I often think "What if God Were a Black Woman." This quilt was inspired by my favorite memories of my grandma. Even though she died when I was young I'll never forget her kindness. I remember everytime I came to visit, she would let me brush her gray and silver hair. I made this wall hanging in mind of thinking how God is always talking to us and when we listen, we can feel free and alive. I've had so many moments where I know I'm being watched over and it feels good to know I'm not on this journey alone. I think this is one of my favorites because I've always enjoyed how the bright african prints come alive when you look at this wall hanging. I had in mind feeling loved when I thought of my mom and it just created itself. Size: Approx. 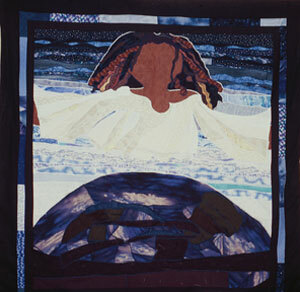 25" x 60"
This is a movie quilt that I created when it was a trying time, feeling like the weight of the world was on my shoulders and it was hard to move. But slowly, as the situation changes, your on top of your problems and feel that you learned more than you thought you would from what was going on. 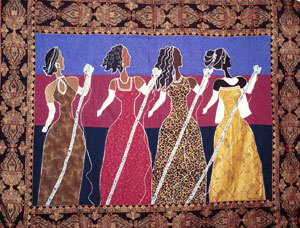 This wall quilt inspired me by the love that I feel for my sisters. We have completely different personalities, but we love each other unconditionally and learn to undertand each other more as we get older. Thank God for my sisters! What If I Where God? Size: Approx. 30" x 32"
I was inspired to make this piece by thinking of all the being so busy that you go through life not really noticing people or those that have a sign asking for help or food. What if we walked past God, would we still be too busy to notice? If he needed help or food? This wall quilt tells a story of a mama spending time with her young girl in amazement as she watches her grow before her eyes. This creation is about story time and all the wonderments it brings. I remember every night my mom would read to me and we would go to distant places or read about that little engine that could and I've always loved being read too as well as using my imagination. This tells a story of friends together enjoying the night life of New Orleans. Everyone is in Marte Gras masks and having a great time! I've always worn braids and really like how many styles and ways to do your hair to get just the right look! It doesn't matter what season, they are always a hit. This is what I had in mind when I created this piece. It's so fun to get together with friends on a Spring morning to laugh and enjoy each others company, and this is what I had in mind when I created this wall quilt. Just being with people who make you happy. We've all seen her. That one lady that stands out in a crowd with the smile that will light up the whole room. She has confidence and you can see it a mile away. Actually, everyone will stop and stare. That's what inspired this wall hanging. My inspiration comes from places, people, real life experiences, and ways I view the world. When you wear a Katrina Gorman Designs original or have a framed fabric art piece in your home, office or favorite surrounding, you will be able to feel the care and love that goes into each piece. This is why my solgan is "Love is in the Art." 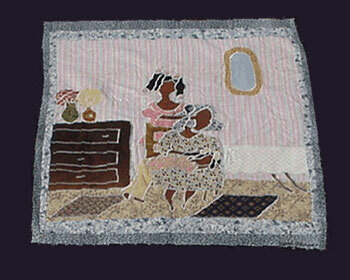 I use an applique style to create one of a kind original art. The style of art portrayed in my work is best described with real experiences, aspirations and people who promote optimisim and hope, which reflects my own personality. I conduct my business the same way I conduct my life, with integrity, fairness and respect. These quilts in the Masterpiece Collection are all One of a kind originals and will not be duplicated in the same composition, design or fabric, and are directly my own creation. With each piece sold, you will recieve authenticity papers that document such. The time, quality and care given to create these keepsakes are important to me. It is my hope and best intention that they will bring a new found joy and beauty into your life. In this classic collection, my style is evolving from my earlier works and the imperfections that might be displayed are a unintended but apart of my creative journey. I thank you for believing in my work! Now I invite you to browse through these pieces of my classic collection. Feel free to call our studio with any questions. Were glad to help!